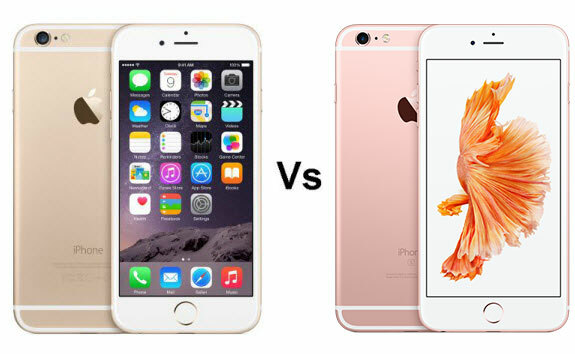 iPhone 6 vs. iPhone 6s: What are the differences? On September 9th, Apple’s new phone iPhone 6s is released. At first sight, it is nearly identical to iPhone 6 in terms of design. Many people may be disappointed that there is no innovation. But there exists some differences between iPhone 6 and iPhone 6s. The following is a comparison of the two iPhones in design, display, processor and camera. Some new features of iPhone 6s will be seen in the comparison, too. iPhone 6 and iPhone 6s are just like twins. We can’t distinguish them by eyes. However, iPhone 6s is larger and wider than iPhone 6. And the most attractive point is the new color, rose gold. iPhone 6s has retina HD display with 3D Touch which is originally Force Touch technology that sits inside the Apple Watch , enabling new ways of interacting with the phone. The processor of iPhone 6s is a new Apple A9 chipset, a third-gen 64-bit chip with support for 23 LTE bands. It uses new transistor technology to allow for 90% improvement in graphics processing and a 70% improvement in general performance from the last-gen A8 applied to iPhone 6.
iPhone 6 features an 8MP iSight camera while iPhone 6s features a 12MP one.The 12MP iSight camera is now a 12MP sensor with optical image stabilisation and 4K capture. A new capture called Live Photos is applied as well which allows you to capture a picture and video in one. Take a picture the normal way on the iPhone, take a look at it afterwards, and motion is added. You know iTunes is a wonderful platform to enjoy various resources like movies, music and TV shows. However, the resources in iTunes are either purchases or rentals. Since there are some limits on iTunes rentals, you can't enjoy them on iPhone 6 or iPhone 6s anytime and anywhere. For example, iTunes rentals can only be available within 30 days and you must finish watching in 24 hours as soon as you begin to do. In this case, you can’t miss AVS4Mac iTunes M4V Converter Plus, a useful tool to keep iTunes rentals forever. AVS4mac iTunes M4V Converter Plus is a professional DRM removal tool which can remove DRM protection from both purchased and rented iTunes M4V movies, TV shows and music videos. After removing DRM from iTunes rentals, you can convert the rentals to common format, like MP4 or MOV. Then use iTunes to transfer converted files to your iPhone 6 or iPhone 6s. Note: The trial version of AVS4Mac iTunes M4V Converter Plus only allows one minute conversion. You can purchase the full version with only $44.95 while the original price is $49.95. Every time Apple releases new phones will catch a lot of attention. For most people, the “S” versions mean more convenience and more pleasure. They always wait for the release to see if it is worthy to buy. Now you’ve got some differences between iPhone 6 and iPhone 6s and also the new features of iPhone 6s, which one do you prefer? Would you like to buy the new iPhone 6s?